Alhamdulillah from Mawlana Shaykh’s teaching that we are now entering the holy month of Dhul Hajj and in the beginning of the Hajj, and the pilgrimage towards the Divinely Presence. That is symbolic by the Hajj and the twelfth month and the completion of the journey toward the movement of Divinely Presence. And everything of the realities of Islam are the realities of the Heavens. The realities of nature and everything around us shows us proof of what Prophet (sallallahu alayhi wa sallam) brought for humanity. That is its greatness that you can’t have something that only you say it to be true and nothing around you confirms that. The greatness of Sayyidina Muhammad (saws) is that he brings for us a religion with its laws, its rituals, its teachings and you see all of its reality in nature in its natural form of submission that Allah Azza wa Jal wants for us the same. 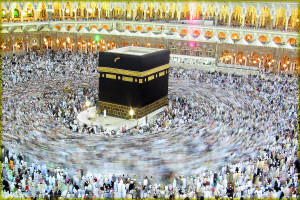 The importance of Hajj from Mawlana Shaykh’s teaching, one of many oceans of reality, is that tawaf and circumambulation is the symbolic presence of the Divinely Presence. It is a symbol in our life that the Light is supreme, the Lord is supreme, Allah Azza wa Jal is supreme. And everything must circumambulate that which is supreme. 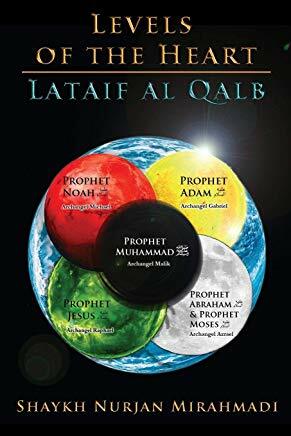 That which is false and imitated, it must move around and circumambulate that which is true, what we call Haqq, the Reality. 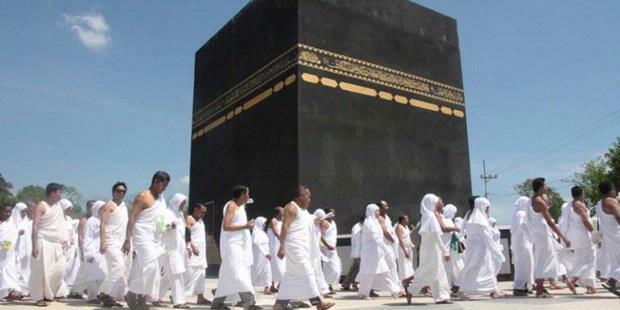 It means then when you watch the tawaf of Ka`bah it is symbolic, and everything around us will show that reality. 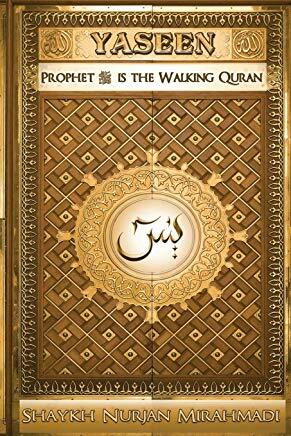 So we look at the Tawaf, and it symbolized by the heart, it symbolized by the Divinely Presence. We come into that reality, asking to lose our identity, to strip away our clothing that identifies us from wealth, from status, from everything. We take away everything and you put two sheets of cloth and you circumambulate what is symbolic of the Divinely Presence. Nobody believes the house to be Allah Azza wa Jal’s Presence. It is a tajjali and manifestation that unifies humanity and reminds our humanity that: I am not independent and I am dependent on my Creator. And from my creator comes all powers, all energies, all realities, and I am merely a manifestation. And I am circumambulating saying, “Labbayk, allahuma labbayk لبيك الهم لبيك , I have heard Your call and I am coming.” Everything in nature shows us that reality. You can say,”O I am not Muslim, and I am not going to do that,” and Allah Azza wa Jal, doesn’t mind, doesn’t care, doesn’t matter because being Muslim is not a name and is not a noun. It’s not a label, but it means one who submits. They teach us that look at the Earth, all of us are making a Hajj; because the Earth is making tawaf around the Sun. So if you want to go for Hajj or you don’t want to go for Hajj, it doesn’t matter. 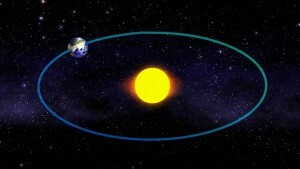 But when you look back and see my Earth is circumambulating the Sun and you are making a tawaf around the Sun. You are now making a Hajj because the Sun is symbolic of Light and the Light is eternal. It is the same Sun that was for Nabi Musa (Moses) alayhi ‘s-salaam, and was for Sayyidina Adam alayhis-salaam. It was the Light and the Light has always been and we came and went. We lived a few years on this Earth, we built a few structures and all of them went, and the Sun is still there. Means it was symbolic, that your Earth is making tawaf, it is circumambulating My Divinely Majesty. You need that Sun to eat, you need that Sun to breathe; without the Sun and photosynthesis you have no air. Without that Sun you have no sight. Means every vegetation and every food, and every breathe we take is from that. Then Allah Azza wa Jal says: make tawaf, and ordered the Earth, you make a circumambulation, to show who is the majestic one. It is the Sun. It has a supremacy over the Earth and the Earth makes its tawaf. Then Allah Azza wa Jal is describing in Holy Qur’an: We will show you every sign from the horizon and within yourselves. They circumambulate the center, the nucleus, and the nucleus represents the ‘power’. The nucleus represents the goal, the source of energy, the source of all realities, emanating. 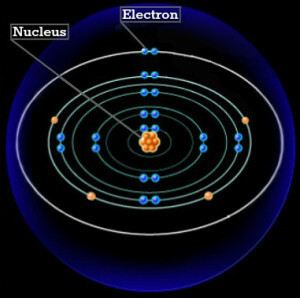 And what makes the electrons to circumambulate is the power of the nucleus. We exist because of that circumambulation. It means if the ego wants to make pilgrimage or not Allah Azza wa Jal doesn’t care, but If you look around you see the Earth making its pilgrimage. We see our internal reality, its existence is based on that concept. Your electrons are circumambulating because of the force and the attraction to the center. If there was no attraction to the nucleus, which is the Divinely Presence, the electrons would not move; they would stand and drop. It is their love for the center, their desire to unite and move to the center, which creates now the attraction. A powerful attraction that it now wants to come and Allah Azza wa Jal doesn’t give permission, and it begins now the movement and the circumambulation. It means there are three forces; ‘mass attraction’, ‘circumambulation’ ,and ‘upward thrust’ is the reality of our entire existence. All your electrons, in love with the center, the nucleus, because of that attraction they are beginning to circumambulate. Anything that circumambulates at the speed in which the electrons are circumambulating, they begin to forget why they are circumambulating and begin to levitate. So they love, they begin to follow and the third, they are levitating. Why do we have a hologram as an existence? All science came and said we are holograms. Your atoms are just moving very fast and giving the appearance of something solid. And that’s all because of love. If that love was taken away, the electron would not circumambulate. If the electron did not circumambulate, there would be no form. There would be no circumambulation, there would be no existence. It means Allah Azza wa Jal created this Creation out of Divinely Love. So we learn that our smallest reality is existing in that tawaf. We see the outward people making that tawaf . We see the planet making the tawaf. This is what Allah Azza wa Jal and Prophet sallalaho alayhi wa ‘sallam, brought for us. That you see all My Signs upon the horizon and you see it within yourself. The reality of Islam, not someone’s crazy interpretation. The reality of Islam is the reality of submission. 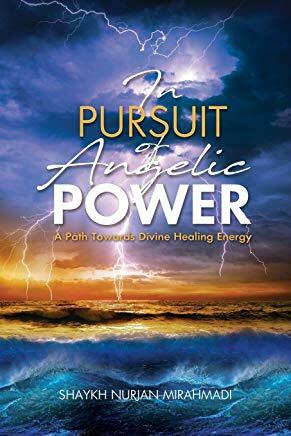 The reality of Divinely Presence is the reality of submission to the Divinely Love, which loves everything, which nurtures everything, which cares for everything. We are on this Earth for love. We are on this Earth to find our reality. We are not on the Earth to harm anyone, we are not on the Earth to judge anyone. If anything, the only one we should judge is ourselves: is Allah going to be happy with me or not? 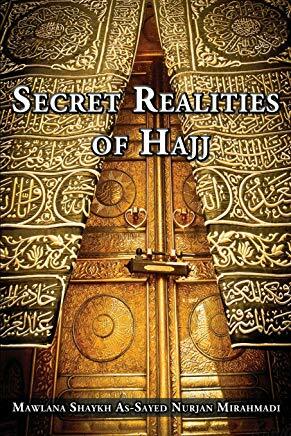 Then the Hajj opens up a tremendous reality of everything is based on circumambulation. You circumambulate that which you love. It means even your attendance and coming for majlis of zikr is based on love. If we don’t love it, we don’t come. And when we come, it is an expression of love and you grow. It means the love brings you. Constantly moving in that love and you find your elevation and spiritual growth. Whether it is the hologram of the physicality or whether it is the Mi`raj of the soul, moving to the Divinely Presence, it is based on love. It has such an attraction for the Divinely Presence, the soul is moving to be in the nucleus. Not stuck with the world of form and playing only with the form. “Thy kingdom come”, ‘Thy’ Kingdom, not your kingdom or my kingdom, ‘Thy Kingdom’ “on Earth as it is in Heaven.” It means tasleem, and submit. Submit to My Kingdom, My Kingdom governs everything. But only Mankind, you are jahool, you are ignorant. Allah calls us in Holy Qur’an: Mankind is ignorant. I offered these realities to the mountains, they said, ‘no’. I offered to all of creation and they said ‘no’. But only mankind said, “I will take it” because they didn’t understand the extent of the reality and how they are going to be accountable to Allah Azza wa Jal. That is why everything in nature submits. Everything in nature shows its complete submission. Then they say even look closer, how did you get on this Earth? When your baba met your mama. How did you came on to this Earth? Your mom has a womb that is called a haramain (sacred sanctity). The womb, no haram allowed in the womb, that is why we are not allowed to show the belly of a woman because, it is the haramain. There should be no haram in that womb, it carries the secret of life. Allah drops one Ka’bah, one egg drops into the womb, it is a Ka`bah. Ka`bah is one, the nucleus is one, no many gods and multiple gods; laa shareek (No partner), it is one. The oneness of egg is dropped into the womb which is the Makkah, no haram. That one egg comes and the male releases 500,000, or whatever it is. There is a lot of hajjis released into the haramain. If you watch under the microscope on YouTube those hajjis, they shine with a white light. They show them moving around the egg exactly like you have an aerial footage of the Ka’bah. Allah wants to remind us: why you became so big? Didn’t you come from this fluid that by its nature is dirty and you have to wash. 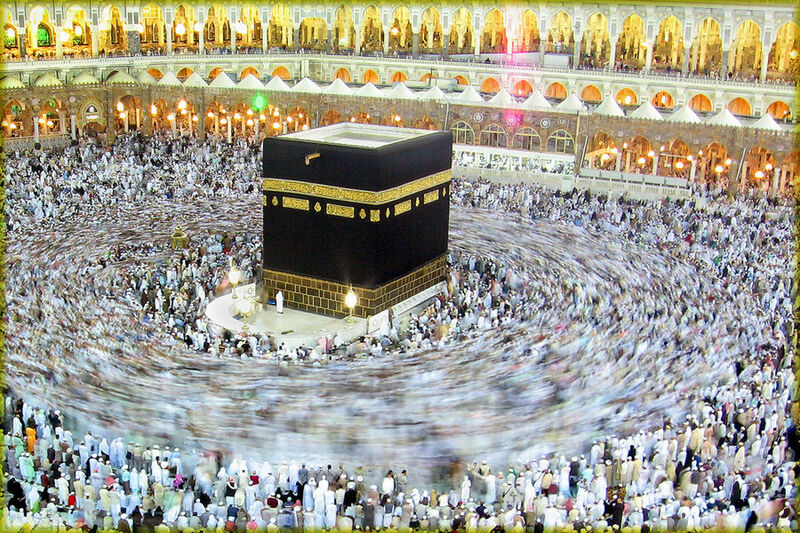 When you look with the microscope, that image is just like watching the tawaf of the Ka’bah, because there is no more color, there is just these white clothes and people moving. Then you look again at the microscope and the images from YouTube, and they are all fighting to kiss the black stone. 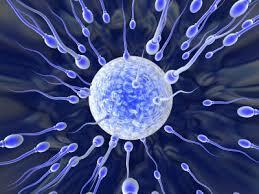 It means the one seed that comes in to the egg, it becomes the one whom Allah is going to grant the secret of life. It means we made a Hajj in our mom’s womb. We are the ones who won that ticket. We described that seven or eight years ago and a reminder for ourselves that we are the ones that won. 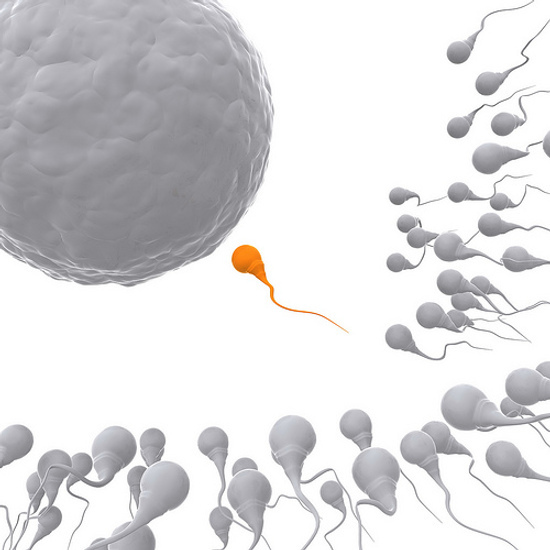 We had 499,999 brothers and sisters that they didn’t make it. I was the one who Allah granted my Hajj to be real, and my seed went into the egg. And Allah granted that egg: you are now going to be granted a life. Come out and have an existence but remember where you came from, you came from that Hajj. Everything around you shows that Hajj. Why is it that you grow up and become a renegade to My submission and say, “I am no longer going to make tawaf around You? I am no longer going to listen to You. I am no longer going to submit to You?” That is the only reason why Allah Azza wa Jal sent the prophets, to remind: didn’t you come from this Hajj? Isn’t everything around you based on this Hajj? So then submit yourself and make your intention for Hajj. And everything around us should show that reality. And every reality the Prophet sallallahu alayhi wa sallam brought and revealed through holy Quran, has a sign within ourselves and upon the horizon. Upon the horizon is easier to see versus seeing the reality within ourselves. The reality within ourselves requires a firasat and a vision, that we be true and honest with ourselves and we see that reality. We pray that this holy month opening inshaAllah on Saturday night or Sunday night depending upon where people are, that Allah dress us from that reality. Bless us from the realities of Hajj, bless us from the reality of our first Hajj that brought us here. Yaa Rabbi (O our Lord) You brought us through that Hajj, put us onto this Earth, now save us. Protect us from difficulty, protect us from wrong. Keep us under Your guidance and the intercession of Sayyidina Muhammad sallallahu alayhi wa sallam, under the love of Sayyidina Muhammad sallallahu alayhi wa sallam, under the love and nazar of awliya. And then that we return back to Your Divinely Presence with our Hajj being completed and our submission inshaAllah trying to complete to the best of our ability.